Smartphone Millions scam came to our attention when 3 of our readers alerted us of the same program in a single day. They’ve lost money with it, so make sure you read the full Smartphone Millions review to understand what you are getting into. 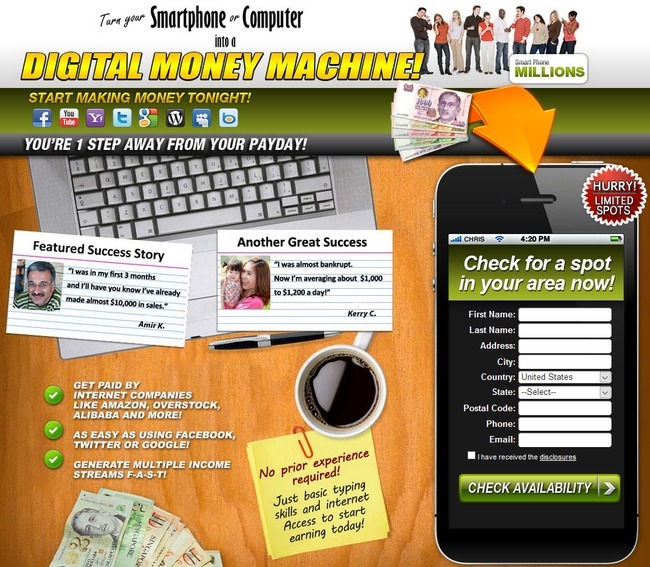 The homepage of Smartphone Millions consists of a template that has been used in several other scams that we have reviewed earlier, including Online Cash Source and Online Wealth Markets. These scams are invariably portrayed as online job positions, using words such as “payday” and “no prior experience required” to lower the guard of its potential victims. 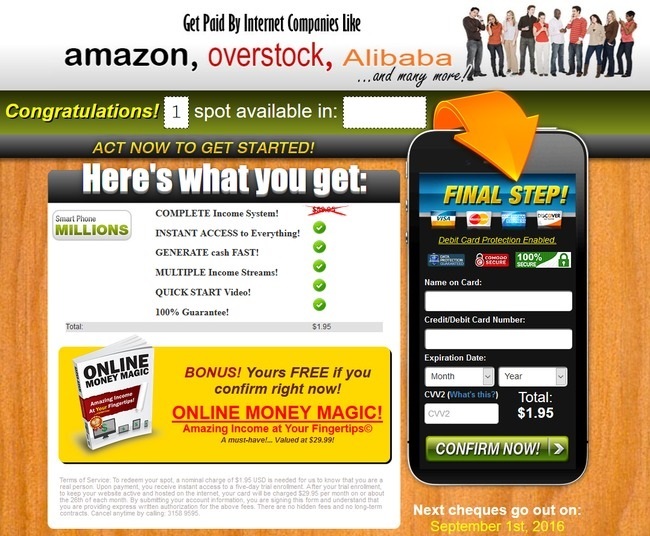 The homepage is designed to make you think that you are trying to gain access to an online job by internet companies such as Amazon, Overstock and Alibaba. The scammers use the online form displayed in the screenshot above to “check for a spot in your area”, but there are actually no limited spots. Even if you visit the page months later, the webpage will still be there. The sole purpose of the form is to acquire your personal information, so they can make high-pressure sales calls and coerce you into buying more scam products. It’s normal for some websites to request some basic information, such as your email address for reservation purposes. But if you come across an unknown website asking for sensitive information such as phone number, full name and home address, you really should think twice before giving them out. These are information that you should safeguard properly unless you absolutely trust the website. For the purpose of this review, I used a phone number that I’m no longer using to find out what’s hidden behind the form. After submitting your personal information, you will be brought to the payment page as displayed in screenshot above. If you’ve provided all your personal information for Smartphone Millions hoping to get more information about the opportunity, you’ll be sorely disappointed. You have to pay first, without knowing what you are getting yourself into. It sounds ridiculous, but this is the modus operandi for many online scams. They use the curiosity of victims to trap them into a money hell-hole. Even though the activation price is very low at just $1.95, it’s not that simple. Take a look at the greyed out disclaimer below the payment page. Most of the victims don’t even realize the $29.95/month payment they are subjected to make after they sign up for the scam. The payments will be deducted from your credit card every single month until you cancel them. I’ve had extremely similar experience with Online Cash Source scam, but for the sake of this review I paid $1.95 for Smartphone Millions to see what’s hidden behind the curtains. Unsurprisingly, I was redirected to another scam called Explosive Payday. Again, I have to make a payment to know what it is all about. We’ve also received reports from our readers where they were redirected to other websites after making the payment. It appears that the redirection is done based on geolocation of the user, and there are several other scams in rotation. You may see a different page after making your payment. However, one thing in common is the sales call that you will receive shortly after making the $1.95 payment. You will be pressured to upgrade your membership, and to purchase various up-sell programs to ensure you success online. And after all the payments that you make, you’ll end up with a bunch of useless products that won’t even make you a dime. Don’t buy into these kind of up-sells, because you don’t need to pay so much to start an online business. Wealthy Affiliate teaches you the appropriate way to make money online, and you don’t have to pay a cent to get started. Is Smartphone Millions a Scam? Zero Loss Formula Review – Lost $250 With the Scam! The description of the methodology describes very well what happened to me. In my case, it was a website that I could customize and monetize for only $1.95 US (I live in Canada). Then I was contacted by their high-pressure salesman. He managed to pressure me into parting with a total of $4,261.34 (Canadian). I thought I was smarter than that. I thought no one could pull the wall over my eyes…. but he was good! Very good. I did receive weekly training or tutorial calls to help me customize the website, but they started six months ago and to date, after following their instructions to the letter, I still haven’t made a penny in sales. Last week he called again, asking for several thousand more dollars, and tried for over an hour. I was polite this time but firm. I’m an old age pensioner on a fixed income who can barely afford my utility bills. They are very hard to track down because they went by several different names when they accessed my credit card. I had to go to the bottom of the printout receipt they sent me to get the smartphonemillions.com name. All charges to my credit card were under different names. 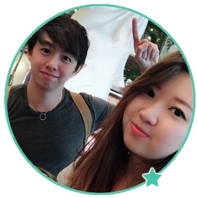 Hi Maurice, no one should have to pay that much money in order to learn making money online. Try to remove all these scam accounts that access your credit card, or if you can’t weed them out I’d suggest cancel the card altogether. And if you come across some “online opportunities” that won’t disclose their method without you paying a huge sum of money, give it a pass. It’s most likely an online scam. It only took me about 30 seconds to see the scam because the ad i saw sent me to a page no even linked to what was claimed. Then…… I look for what it was i would do to earn that big cash while holding a baby in my new house. I spent 9 years promoting products back in the 1970’s and i know what to look for based on what they DON’T say. These scams use the promise of big bags of money for the HOOK to reel you in but you must watch for what it is you must do to earn that money. Hey Gerry, thanks for the comment and the tips. how to get this application form tq. I’m not sure what application form you are trying to get?